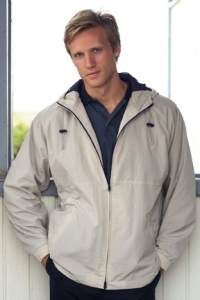 Casual, lightweight jackets for spring, summer and fall. Water-repellant finish. Some styles with hoods. 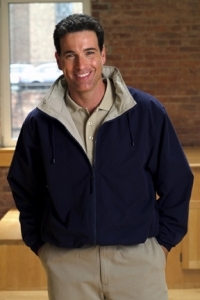 Choice of styles in nylon or polyester microfiber. Some with fleece lining for extra warmth. 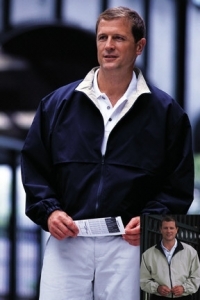 Perfect for golf and other sports or casual outdoor activity. Can be embroidered with any logo. Big and tall sizes available. 100% air-jet textured nylon body with water-repellent finish, hooded neck with elasticized drawcord and cordlocks, covered full-zip front, two-way zipper, slash front pockets, elasticized cuffs, contrasting mesh lined body, velcro caped back, elasticized drawcord bottom with cordlocks. Imported. XS-3XL. 100% polyester sueded microfiber body, stand-up collar, full-zip front, on-seam side pockets with snap closure, back flap, elasticized waist and cuffs, inside pen pocket and cell phone pocket, taffeta lining. Imported. XS-3XL. 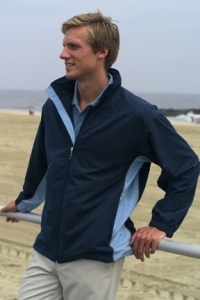 100% polyester sueded microfiber body with water-repellent finish, stand-up collar with contrast color lining, full-zip front, zip-out hooded neck with drawcord, on-seam side pockets, cape back, elasticized waist and cuffs, mesh lining. Imported. XS-5XL. 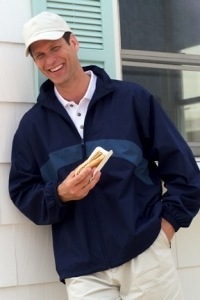 100% polyester sueded microfiber body with water-repellent finish, stand-up collar, full-zip front, cape front allows for decoration on both sides, slash front pockets with snap closure on both sides, elasticized cuffs and waistband. Imported. XS-3XL. 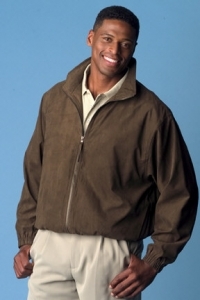 100% polyester rip-stop body with water-repellent finish, stand-up collar, full-zip front, contrasting chest block, front slash pockets with zipper, elasticized cuffs, dropped back bottom with elasticized drawcord with cordlocks, taffeta lining. Imported. XS-3XL. 100% high-count microfiber polyester body with water-repellent finish, zip-out hooded neck with elasticized drawcord, contrasting color block and seam piping, full-zip front, on-seam zip front pockets, elasticized cuffs, mesh lined body, elasticized drawstring bottom with cordlocks. Imported. XS-3XL. 100% air-jet textured nylon body with water-repellent finish, hooded neck with elasticized drawcord and cordlocks, 1/2 zip front, zipper front pocket that folds into self-pouch, multi-seamed detailing, elastic cuffs, elasticized drawcord bottom with cordlock, black mesh body lining, taffeta sleeve lining. Imported. XS-3XL.